Birthday: May 13 Constellation: Taurus Blood type: A Height: 160cm ~ 5'3'' Bust: 88cm Waist: 58cm Hip: 85cm Weight: 48kg Favorite animal: African Elephant Favorite food: Pork cutlet Kotomi is another schoolmate of Tomoya's in the same year, but, like Kyou, is in a separate class from Tomoya. The "Koto" in Kotomi is derived from the Japanese musical stringed instrument of the same name. She is in the top ten for every subject throughout the whole country in standardized exam results—she always goes to library to read extra materials, especially books in foreign languages. Kotomi is a very quiet girl and it is quite difficult to communicate with her. In her spare time, she plays the violin, although she is very poor at it to the point of causing pain to those who hear her play. Tomoya meets her for the first time when he enters the library and found Kotomi sitting on the floor barefoot, reading books with scissors in her hand, and acts oddly with Tomoya. After several meetings with Kotomi, Tomoya starts skipping the fourth period and spend time with Kotomi in the library. Tomoya decides to force Kotomi to join the drama club to make her more sociable. Just when Kotomi starts to open up to everyone, a bus accident causes her to breakdown in front of everyone and returns home later. Tomoya visits her in her house and learns that he and Kotomi were childhood friends, but lost contact with each other after Kotomi's parents died in an plane-accident. Not wanting to feel the pain of losing someone important anymore, and asks Tomoya to leave her alone. Wanting to bring Kotomi away from her past, Tomoya decides to renovate her garden, while the drama club members decide to gift her a violin, but was unfortunately destroyed. 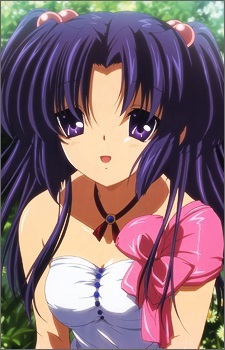 After renovating Kotomi's garden, Kotomi appears to Tomoya, and after some poignant conversation, Tomoya brings Kotomi out of her house to see the outside world inside her heart. The next day, her guardian presents Kotomi her parent's briefcase that has traveled all the way to Japan, and inside is a teddy bear and a testimony, asking Kotomi to live the way she wants and grow up to be an adult. Kotomi realizes she is still being loved by her parents even after their death and cries. After this, Kotomi becomes more mature, and the drama club members finally give Kotomi a violin. In the anime adaptation Clannad After Story, Kotomi moves to America to further her studies. She, however, occasionally visits Tomoya and the others, and in the movie adaptation, Kotomi only made a cameo appearance, as she is only seen conducting a song for the members of the Choir Club.